Getting all the air out from your cooling system after a water pump or thermostat replacement can be really difficult. Your engine could easily overheat and you may damage your engine if you have not to get out the air from the cooling system completely. I work as a mechanic and I have found a really good way to get out the air of the cooling system fast and effective. This method can differ a bit between different car brands but the principle is the same. Follow this guide in step to step and get all the air out fast and safe. There are actually two different methods of getting the air out from your cooling system. The manual method is the old style variant of bleeding the coolant system. Some cars have an air bleed valve to get the air out from the system, and some cars don’t have this air bleed valve which makes it a lot more difficult. However, the method for both of them is the same. Check out the step to step guide down below to bleed your cars cooling system efficiency. The new method, which I use myself is the vacuum method. To use this method, you need a vacuum tool for this and compressed air (Depending on the tool). However, this method is creating a vacuum and sucking out all the air from the coolant system within seconds and then fill all the vacuum space with the coolant system instead. This is a really efficient method if you have the tool and you do never have to worry about car bleeding anymore. You will get a perfect result every time and the process is made under a minute. If you do not have access to compressed air and a vacuum cooling bleeder, it’s okay to do it the manual way also. This is the way I do it when I do not have access to the vacuum bleeder. The first step in this guide is to make sure your anti-freeze is ready. You should always use the correct coolant that is required by your manufacturer. The wrong type of coolant could damage your engine! If you are not sure of which coolant you should have, check your repair manual or contact your authorized dealer. Generally, mix the coolant with 50% water and 50% coolant (If Concentrated anti-freeze). Always read the description of your coolant for the correct instructions. 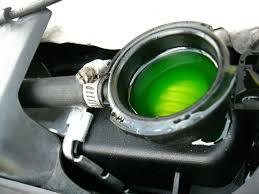 If you are living in a cold country, you have to make sure that the coolant mix is correct. If your coolant freeze in your engine, you will destroy your engine. To check your coolant freeze level, you can use a REED Glycol Refactometer with ATC (C°) Link to Amazon. If you have your coolant ready, we can continue to the next step. A step that not many people do but will get you a much better result, is to raise up the front of your vehicle first. With this method, you will get the air out of the car a lot easier. Especially if your filling cap is at your radiator. If you have a car with an external expansion tank, this may not be necessary. To raise the front of the car you could either use a jack or put the car on a steep hill with the front upwards. If you are going to raise your car with a jack, check your repair manual for the right jacking points to not damage anything under your car. If you are going to use a jack, use a good jack and not the jack that you get included with your car. These jacks are dangerous and have caused a lot of injuries. If you do not have a good jack at home and are interested to buy one, you can check out our review of the best floor jacks. When raising up your car with a jack, always also use Jack Stands also to prevent any accidents. You should now start your engine. The best way to do this is to get help from a friend. When you are starting your engine, the water pump could push out some coolant from the radiator if there is air inside. 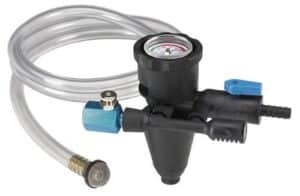 To prevent this a lot, the EPAuto Spill Proof Radiator Coolant Filling Funnel Kit Link to Amazon becomes really useful to prevent any spill. After you have started your engine you should now turn the climate control heat to MAX. Depending on the car, but many cars use a valve that will restrict the coolant from flowing inside the thermal pack in the car if the climate control is set to cold. Other cars redirect the airflow and not the coolant flow, so with these cars, this step will not make a difference. No matter which model you have, it’s an easy step to put your climate control to the MAX heat. You should now rev up your engine a bit. This could cause the coolant to flow out of the radiator if you are not using the spill tool and I recommend to have a friend with you for this task. If you have a friend with you, you can loosen your air bleeding valves at the same time as your friend is revving the engine. Be attentive to any coolant temperature peaks and coolant leaks at this point. You should now make sure that you can’t find any leaks from after your reparation. If it seems good, take your car out for a long test drive. 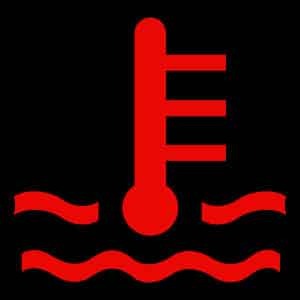 Be very attentive about your coolant temperature at the test drive and make sure the car does not start to overheat. Overheating can cause your head gasket to blow and you really do not want that to happen. Check all the functions and the temperature of the climate control. If your test drive went well without any temperature peaks or other strange behaviours, open your hood and check your coolant level again. Check for any coolant leaks. After this you can let your vehicle stand for a couple of hours, then take another test drive and do the same procedure and check for leaks and the coolant level. After all these steps your reparation should now be successful. If any strange behaviours, repeat this guide or continue your troubleshooting. Check that guide out for any troubleshooting to your car. Many people replace parts without any troubleshooting at all. Don’t do that! Read our troubleshooting articles and learn how to troubleshoot in a proper way. Stop wasting money on replacing parts that were not damaged from the beginning. I hope you liked this guide and your reparation went successfully. If you have any questions about this guide you can comment down below. If you have any other questions about your car that you want answers for. You can ask us to our homepage.